The application files can be copied to a computer via iTunes file share or you can use internal Web access service to download or upload files. Complete project files stored in folder "projects" and have extension ".plist". Each file it's one project and contain all data of the project. Name of these files it's unique ID of project. Please note: You should not change name of this file or its contents. Project files can be copied to computer through iTunes file share or upload from internal Web access and upload to another device through internal Web access. Created MIDI files have extension ".mid" and stored in folder "midi" and can be copied to computer through iTunes file share or internal Web access. Set this checkbox to enable internal Web access service. If web service will runs completely you will see the address (URL) that you need to specify in web browser to access this service. Please note: On your device should be enabled and connected WiFi service. Internal Web service is accessible only into your local network and can't accessible through Internet or through public WiFi access point. When you leave "Export project" section or application switches to background mode the internal Web service will be stopped. Two checkboxes are selected that will be stored in the MIDI file. It can be complete song or individual patterns. When switching to the patterns, by default will be selected patterns that contain events (not empty). When checkbox "Skip empty track" in on, tracks that not contain events not exported. When this checkbox is off all tracks of all selected patterns will be exported by order starting from track 1 pattern 1 and ending track 8 of last pattern even the track haven't any events. 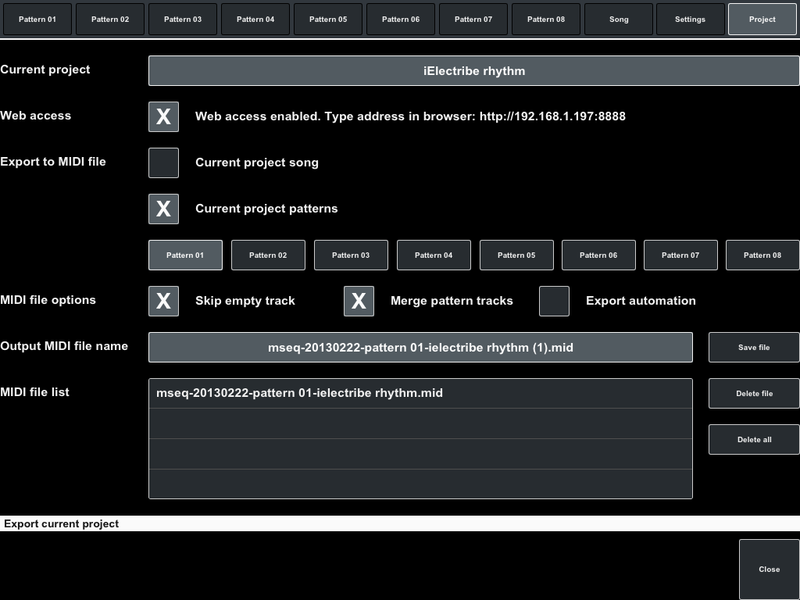 When checkbox "Merge pattern tracks" in on, all tracks of pattern will be merged in one MIDI file track. If you select few patterns MIDI files will contain separate track for each pattern. Set checkbox "Export automation" if you need to export automation events to MIDI file. Automation events will be exported with controller number and type (CC/RPN/NRPN) that specified for track. 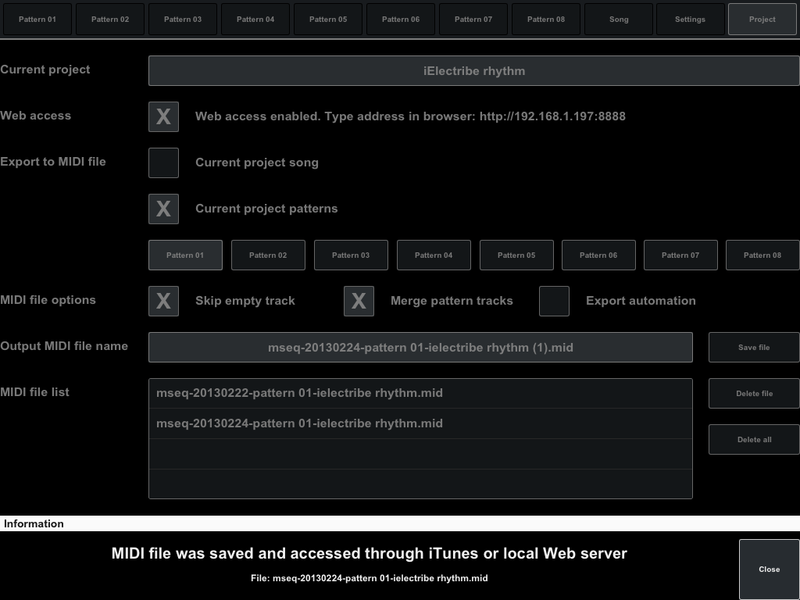 Name of the output MIDI file is generated automatically based on your selection (song or patterns). If file with generated name already exists to end of the name will be appended the unique number. Click button "Save file" to create new MIDI file with current settings. All created files will show in the MIDI file list. You can delete any of these files or delete all files. To delete one file select this file in list and click button "Delete file". If you want delete all MIDI files click button "Delete all".